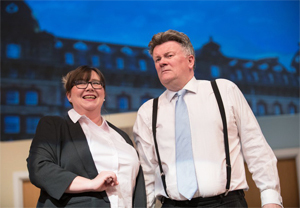 Altrincham Garrick must have one of the finest theatres of any amateur drama group in the country and the ample stage area was given full justice with a superb set of a sumptuous hotel bedroom and lounge. This is matched with impeccable costuming, including some dapper ‘power-suits’, and all the cast delivered their lines crisply. There is much to enjoy in Up and Coming but unlike a typical farce, the pace remains almost constant throughout, which is a pity because there are several opportunities in this play where the ante could have been significantly raised, essentially by delivery at a faster pace and with much more emotive acting. The play is in essence well cast with David Beddy as the Rt. Hon. Phillip Conway MP having all the gravitas of a Michael Heseltine (or even an Alan Clark) and Joanne Buxton is good as Vicky, his would-be mistress, nimbly changing accents to evade every tricky situation. However, despite whatever happens, neither ever seem to be in a state of consternation. When it looks as if Phillip Conway is about to lose the career he’s been building for the last twenty years, he still has the calm demeanour of a man who’s forgotten where he’s left some tool in the garage the previous night (to be fair, he’s equally relaxed when things go very well), and this cool attitude in the face of both adversity and escape permeates the whole play. David Reynold as John Henderson the Prime Minister could give Neville Chamberlain a run for his money in concealing emotion, whilst Mark Edgar-Clarkson is amusing as Barrymore, the alcoholic MP except for the fact, ala Charles Kennedy, he’s so used to alcohol, Barrymore never seems drunk; realistic maybe but a lost comedic opportunity. Only Martin Oldfield as Higgs the detective ever seems genuinely concerned when things go awry. It's true that not everyone goes into Basil Fawlty crisis mode in the face of disaster, but growing perplexity and horror at progressively worsening situations are what makes most farces, and if most characters generally maintain a stiff upper lip, we are less inclined to find the show funny. The same was true with every entrance, where everyone seemed to have time to calmly hide or change rooms, without ever seeming too rushed. It must be said however that the audience did find Up and Coming very funny, so perhaps a point was proven that you can have a funny farce with the pace remaining almost constant throughout. Overall, a funny show which with better direction and pace could have been a lot funnier. 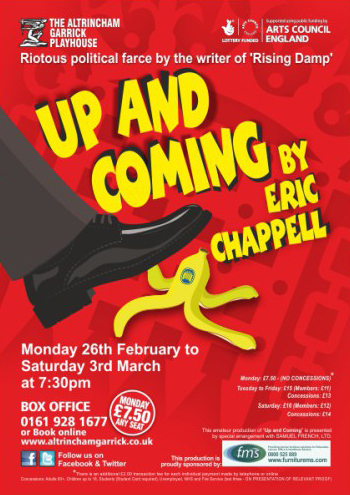 Up and Coming is on at Altrincham Garrick until Saturday 3rd March.